To raise issues with specific articles, see the NPOV noticeboard. For advice on applying this policy, see the NPOV tutorial. For frequent critiques and responses, see the NPOV FAQ. For the template, see Template:POV. This page documents an English Wikipedia policy, a widely accepted standard that all editors should normally follow. Changes made to it should reflect consensus. This page in a nutshell: Articles mustn't take sides, but should explain the sides, fairly and without bias. This applies to both what you say and how you say it. Editing from a neutral point of view (NPOV) means representing fairly, proportionately, and, as far as possible, without bias, all of the significant views that have been published by reliable sources on a topic. All Wikipedia articles and other encyclopedic content must be written from a neutral point of view. NPOV is a fundamental principle of Wikipedia and of other Wikimedia projects. This policy is nonnegotiable and all editors and articles must follow it. "Neutral point of view" is one of Wikipedia's three core content policies. The other two are "Verifiability" and "No original research". These three core policies jointly determine the type and quality of material that is acceptable in Wikipedia articles. Because these policies work in harmony, they should not be interpreted in isolation from one another, and editors should try to familiarize themselves with all three. The principles upon which this policy is based cannot be superseded by other policies or guidelines, or by editor consensus. Achieving what the Wikipedia community understands as neutrality means carefully and critically analyzing a variety of reliable sources and then attempting to convey to the reader the information contained in them fairly, proportionately, and as far as possible without bias. Wikipedia aims to describe disputes, but not engage in them. Editors, while naturally having their own points of view, should strive in good faith to provide complete information, and not to promote one particular point of view over another. As such, the neutral point of view does not mean exclusion of certain points of view, but including all notable and verifiable points of view. Observe the following principles to achieve the level of neutrality that is appropriate for an encyclopedia. Prefer nonjudgmental language. A neutral point of view neither sympathizes with nor disparages its subject (or what reliable sources say about the subject), although this must sometimes be balanced against clarity. Present opinions and conflicting findings in a disinterested tone. Do not editorialize. As a general rule, do not remove sourced information from the encyclopedia solely on the grounds that it seems biased. Instead, try to rewrite the passage or section to achieve a more neutral tone. Biased information can usually be balanced with material cited to other sources to produce a more neutral perspective, so such problems should be fixed when possible through the normal editing process. Remove material only where you have good reason to believe it misinforms or misleads readers in ways that cannot be addressed by rewriting the passage. The sections below offer specific guidance on common problems. See article titling policy for more on choosing an appropriate title for an article. This advice especially applies to article titles. Although multiple terms may be in common usage, a single name should be chosen as the article title, in line with the article titling policy (and other relevant guidelines such as on geographical names). Article titles that combine alternative names are discouraged. For example, "Derry/Londonderry", "Aluminium/Aluminum" or "Flat Earth (Round Earth)" should not be used. Instead, alternative names should be given due prominence within the article itself, and redirects created as appropriate. Neutrality requires that each article or other page in the mainspace fairly represents all significant viewpoints that have been published by reliable sources, in proportion to the prominence of each viewpoint in the published, reliable sources. Giving due weight and avoiding giving undue weight means that articles should not give minority views as much of, or as detailed, a description as more widely held views. Generally, the views of tiny minorities should not be included at all, except perhaps in a "see also" to an article about those specific views. For example, the article on the Earth does not directly mention modern support for the Flat Earth concept, the view of a distinct minority; to do so would give undue weight to it. In articles specifically relating to a minority viewpoint, such views may receive more attention and space. However, these pages should still make appropriate reference to the majority viewpoint wherever relevant and must not represent content strictly from the perspective of the minority view. Specifically, it should always be clear which parts of the text describe the minority view. In addition, the majority view should be explained in sufficient detail that the reader can understand how the minority view differs from it, and controversies regarding aspects of the minority view should be clearly identified and explained. How much detail is required depends on the subject. For instance, articles on historical views such as Flat Earth, with few or no modern proponents, may briefly state the modern position, and then go on to discuss the history of the idea in great detail, neutrally presenting the history of a now-discredited belief. Other minority views may require much more extensive description of the majority view to avoid misleading the reader. See fringe theories guideline and the NPOV FAQ. Wikipedia should not present a dispute as if a view held by a small minority deserved as much attention overall as the majority view. Views that are held by a tiny minority should not be represented except in articles devoted to those views (such as Flat Earth). To give undue weight to the view of a significant minority, or to include that of a tiny minority, might be misleading as to the shape of the dispute. 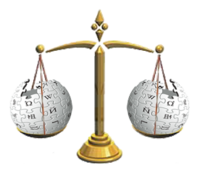 Wikipedia aims to present competing views in proportion to their representation in reliable sources on the subject. This applies not only to article text, but to images, wikilinks, external links, categories, and all other material as well. If a viewpoint is held by an extremely small (or vastly limited) minority, it does not belong in Wikipedia regardless of whether it is true or not and regardless of whether you can prove it or not, except perhaps in some ancillary article. Also, if you can prove some theory that few or none currently believe, Wikipedia is not the place to present such a proof. Once it has been presented and discussed in reliable sources, it may be appropriately included. See "No original research" and "Verifiability". An article should not give undue weight to any aspects of the subject but should strive to treat each aspect with a weight appropriate to its significance to the subject. For example, discussion of isolated events, criticisms, or news reports about a subject may be verifiable and impartial, but still disproportionate to their overall significance to the article topic. This is a concern especially in relation to recent events that may be in the news. Note that undue weight can be given in several ways, including, but not limited to, depth of detail, quantity of text, prominence of placement, and juxtaposition of statements. While it is important to account for all significant viewpoints on any topic, Wikipedia policy does not state or imply that every minority view or extraordinary claim needs to be presented along with commonly accepted mainstream scholarship. There are many such beliefs in the world, some popular and some little-known: claims that the Earth is flat, that the Knights Templar possessed the Holy Grail, that the Apollo moon landings were a hoax, and similar ones. Conspiracy theories, pseudoscience, speculative history, or even plausible but currently unaccepted theories should not be legitimized through comparison to accepted academic scholarship. We do not take a stand on these issues as encyclopedia writers, for or against; we merely omit them where including them would unduly legitimize them, and otherwise describe them in their proper context with respect to established scholarship and the beliefs of the greater world. Good and unbiased research, based upon the best and most reputable authoritative sources available, helps prevent NPOV disagreements. Try the library for reputable books and journal articles, and look for the most reliable online resources. If you need help finding high-quality sources, ask other editors on the talk page of the article you are working on, or ask at the reference desk. Neutrality assigns weight to viewpoints in proportion to their prominence. However, when reputable sources contradict one another and are relatively equal in prominence, describe both approaches and work for balance. This involves describing the opposing views clearly, drawing on secondary or tertiary sources that describe the disagreement from a disinterested viewpoint. Wikipedia articles about art and other creative topics (e.g., musicians, actors, books, etc.) have a tendency to become effusive. This is out of place in an encyclopedia. Aesthetic opinions are diverse and subjective—we might not all agree about who the world's greatest soprano is. However, it is appropriate to note how an artist or a work has been received by prominent experts and the general public. For instance, the article on Shakespeare should note that he is widely considered to be one of the greatest authors in the English language. Articles should provide an overview of the common interpretations of a creative work, preferably with citations to notable individuals holding that interpretation. Verifiable public and scholarly critiques provide useful context for works of art. There are no forbidden words or expressions on Wikipedia, but certain expressions should be used with care, because they may introduce bias. For example, the word "claim" is an expression of doubt; when used as in "John claimed he had not eaten the pie", it can imply he had in fact eaten the pie. Using loaded words such as these may make an article appear to promote one position over another. Try to state the facts more simply without using loaded words; for example, "John said he did not eat the pie." Strive to eliminate expressions that are flattering, disparaging, vague, or clichéd, or that endorse a particular point of view (unless those expressions are part of a quote from a noteworthy source). Biased statements of opinion can be presented only with attribution. For instance, "John Doe is the best baseball player" expresses an opinion and cannot be asserted in Wikipedia as if it were a fact. It can be included as a factual statement about the opinion: "John Doe's baseball skills have been praised by baseball insiders such as Al Kaline and Joe Torre." Opinions must still be verifiable and appropriately cited. All facts and significant points of view on a given subject should be treated in one article except in the case of an article spinout. Some topics are so large that one article cannot reasonably cover all facets of the topic. For example, evolution, evolution as fact and theory, creationism, and creation-evolution controversy are separate articles. This type of split is permissible only if written from a neutral point of view and must not be an attempt to evade the consensus process at another article. It is difficult to draw up a rule, but the following principle may help: there is probably not a good reason to discuss some assumption on a given page, if that assumption is best discussed in depth on some other page. A brief, unobtrusive pointer might be appropriate, however. Pseudoscientific theories are presented by proponents as science, but characteristically fail to adhere to scientific standards and methods. Conversely, by its very nature, scientific consensus is the majority viewpoint of scientists towards a topic. Thus, when talking about pseudoscientific topics, we should not describe these two opposing viewpoints as being equal to each other. While pseudoscience may in some cases be significant to an article, it should not obfuscate the description of the mainstream views of the scientific community. Any inclusion of pseudoscientific views should not give them undue weight. The pseudoscientific view should be clearly described as such. An explanation of how scientists have received pseudoscientific theories should be prominently included. This helps us to describe differing views fairly. This also applies to other fringe subjects, for instance, forms of historical revisionism that are considered by more reliable sources to either lack evidence or actively ignore evidence, such as claims that Pope John Paul I was murdered, or that the Apollo moon landing was faked. Some adherents of a religion might object to a critical historical treatment of their own faith because in their view such analysis discriminates against their religious beliefs. Their point of view must be mentioned if it can be documented by notable, reliable sources, yet note that there is no contradiction. NPOV policy means that Wikipedia editors ought to try to write sentences like this: "Certain Frisbeetarianists (such as Rev. Carlin) believe This and That, and also believe that This and That have been tenets of Friseetarianism from its earliest days; however, influenced by the findings of modern historians and archaeologists (such as Dr. Investigate's textual analysis and Prof. Iconoclast's carbon-dating work) certain sects — calling themselves Ultimate Frisbeetarianists — still believe This, but instead of That now believe Something Else." Several words that have very specific meanings in studies of religion have different meanings in less formal contexts, e.g., fundamentalism, mythology, and (as in the prior paragraph) critical. Wikipedia articles about religious topics should take care to use these words only in their formal senses to avoid causing unnecessary offence or misleading the reader. Conversely, editors should not avoid using terminology that has been established by the majority of the current reliable and notable sources on a topic out of sympathy for a particular point of view, or concern that readers may confuse the formal and informal meanings. Details about particular terms can be found in the Manual of Style. Wikipedia founder Jimmy Wales talking about NPOV at WikiConference India. There's no such thing as objectivity. Everybody with any philosophical sophistication knows that. So, how can we take the NPOV policy seriously? What about views that are morally offensive to most readers, such as sexism and Holocaust denial, that some people actually hold? Surely we are not to be neutral about them? Since the NPOV policy is often unfamiliar to newcomers—and is so central to Wikipedia's approach—many issues surrounding it have been covered before very extensively. If you have some new contribution to make to the debate, you could try policy talk, or bring it up on the Wikipedia-l mailing list. Before asking, please review the links below. NPOV is one of the oldest policies on Wikipedia. Nupedia's "Non-bias policy" was drafted by Larry Sanger in spring or summer of 2000. Wikipedia's first NPOV policy dates back to 16 February 2001. "Avoid bias" was one of the first of Wikipedia's "rules to consider" proposed by Sanger. Jimbo Wales elaborated the "avoid bias" rule with a statement about "neutral point of view" in the early months of Wikipedia (within dialogue with other Wikipedians up to 12 April 2001)—in subsequent versions of the NPOV policy, Jimbo's statement was known as its "original formulation". A more elaborate version of the NPOV policy was written by Larry Sanger, at Meta-Wiki: see "Neutral point of view—draft", Larry Sanger's version of 20 December 2001. After several comments (see edit history of Sanger's draft at Meta) the version by Larry Sanger et al. was incorporated into the Wikipedia policy some time within the next few days (some edits from around that time are lost). The policy was further edited (see edit history of the NPOV policy), resulting in the current version. Another short formulation was introduced by Brion Vibber in Meta: see Meta's "Neutral point of view", introductory version of 17 March 2003. Development of the undue-weight section started in 2003, for which a mailing-list post by Jimbo Wales on 29 September 2003 was instrumental. Jimbo Wales qualifies NPOV as "non-negotiable", consistently, throughout various discussions: November 2003, April 2006, March 2008 (compare also Wales's first statement of principles). ^ "BBC Trust—BBC science coverage given "vote of confidence" by independent report". 20 July 2011. Retrieved 14 August 2011. This page was last edited 22:43, 3 July 2013 by Wikipedia user Charmlet. Based on work by Wikipedia anonymous user imported>Smalljim.